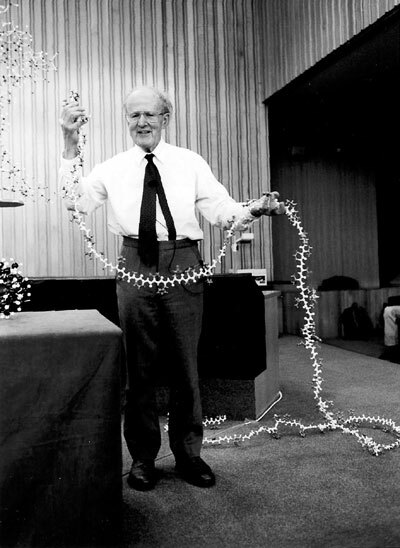 Perutz with his hemoglobin molecule, 1959. Image credit: Life Sciences Foundation. 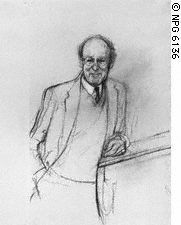 Knowing that his parents were safe from Nazi persecution and able to return to the United States, circumstances began improving for Max Perutz. The Rockefeller Foundation reactivated his grant, allowing him to support himself while stateside as well as his parents in Cambridge, England. Perutz’s father was also able to find work as a laser operator during the war and afterwards qualified for a pension. In September 1941, Perutz met Gisela Peiser, who was an accountant at the Society for the Protection of Science and Learning, an organization that assisted Jewish and other academic refugees fleeing from the Nazis. After a quick courtship, they were married the following March and, in December 1944, welcomed their daughter Vivien into the world. That same year, Perutz also found himself back in good stead with the British government and recruited to research ice strength for potential ice stations in the North Atlantic. The research did not work out, so Perutz returned to his work on hemoglobin at Cambridge. The next few years were spent trying to put together a secure source of income for him and his growing family. In the interim, he took out more loans and found a temporary fellowship. Meanwhile, Perutz’s health continued to suffer. As his chronic gastrointestinal attacks became more unbearable, interfering with his daily activities more and more, Perutz began to seek out help. Most doctors he saw told him it was a psychological problem, but eventually one doctor recognized that the symptoms could be treated by a mixture of atropine and codeine. The remedy helped enough for Perutz to live more or less undisturbed by the problem for several years, though eventually that would change. 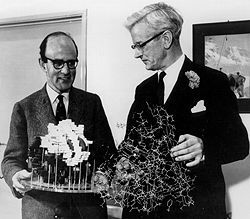 Perutz and John Kendrew, 1962. Image credit: Nobel Foundation. One of the several student researchers that came through the lab was Francis Crick, who started work in 1949. Perutz had Crick look at the validity of his hemoglobin model, which was the culmination of roughly six years of research. Crick applied his mathematical training to show that the model was “nonsense.” Perutz accepted Crick’s assessment and later reflected that only in England at that time could a student be so critical of their principal investigator. 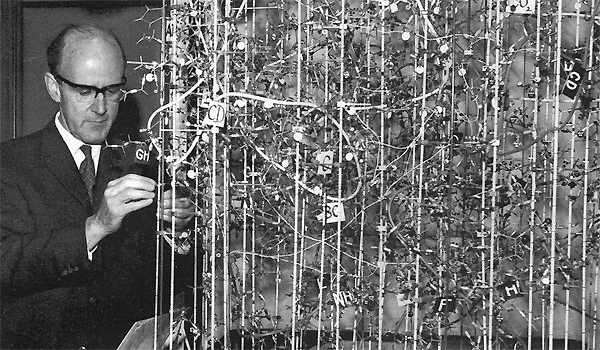 Crick was eventually drawn away from hemoglobin research by James Watson, who came to the lab in 1951 to work under Kendrew on molecular structure, but his impact on the development of Perutz’s hemoglobin structure was long-lived. Throughout the late 1940s, Perutz also continued his work on glaciers in the Alps and helped found the Glacier Physics Committee in 1947. 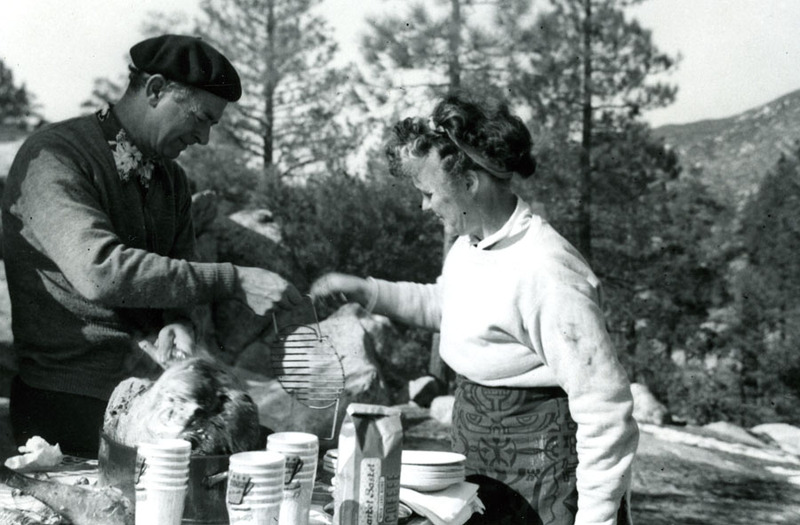 Though he had trouble recruiting able assistants who could also ski (the first two broke their legs), the work gave Perutz and his family the opportunity to spend summers in the mountains. Perutz’s research led him to conclude that glaciers flowed faster at the surface than at the bottom. Perutz’s digestive attacks began increasing in intensity in the early 1950s to the point where, in 1954, he was hospitalized for ten days. While there, doctors looked for possible causes but came up empty and could only prescribe bismuth, with little effect. What did help, for reasons Perutz did not understand, was visiting the Alps, and so he arranged for a trip after being released from the hospital. Unfortunately the attacks resumed as soon as he returned to Cambridge, pushing Perutz to his limits – he considered resignation and even contemplated suicide. In desperate straits, he arranged for another trip to the Alps that spring but, once there, continued to get worse and, as an added complication, came down with scurvy. When he returned, Perutz sought out other doctors who might be able to help, eventually visiting Werner Jacobson, who was also at Cambridge. Jacobson thought Perutz’s symptoms sounded like those of Celiac disease. He suggested that his patient stop eating wheat, or more specifically gluten, which immediately improved Perutz’s condition. Whenever the symptoms appeared again, as they did in the early 1960s, Perutz could trace them back to gluten; he eventually stopped eating any form of bread, since even gluten-free flour contained small amounts of gluten that negatively affected his health. Perutz in lecture. Image credit: Nature. He was the first person to find out how to determine protein structure by X-ray crystallography, after many years of patient struggle, and he applied the technique to solve the structure of haemoglobin, the oxygen-carrying protein in blood….The results showed that it was possible to see, in the atomic detail necessary to understand mechanisms, the structure of the macromolecules that carry out many of the functions of a living cell. Such knowledge is basic to the revolution that has swept through biology in the past 50 years, and to modern medicine and biotechnology. By Fall 1962 there were rumors that Perutz would be awarded the Nobel Prize for chemistry. As October arrived, he began receiving calls from the press, but did not quite trust them. As the calls continued, Perutz received a telegram and thought, along with the rest of the lab, that it may be from the Nobel committee. Alas, the message was only from Nature asking how many reprints of his article Perutz wanted. That afternoon however, Perutz received another telegram, the one he had been waiting for. The lab celebrated with a champagne party as Perutz and Kendrew had been awarded the Nobel Prize for Chemistry, and Watson and Crick, along with Maurice Wilkins, would receive the Nobel Prize in Physiology and Medicine. Perutz continued to work on the hemoglobin structure after his rise to fame, next turning to the question of how the structure changed with the uptake of oxygen. His Nobel lecture described this continued research on the four subunits within hemoglobin that changed their structure as oxygen was taken up; the first description of how proteins changed in structure. In the years that followed, Perutz focused more on why this change occurred. Aided by automated x-ray diffraction machines and able assistants, Perutz’s lab was able to turn out more measurements than ever before. But the measurements, as Perutz later related, did not make any sense. After one of his research assistants completed his postdoc, Perutz looked closer at his results and realized that the new x-ray instruments had not been calibrated correctly. In 1967, with all the bugs fixed, Perutz and his team put together the first atomic model of hemoglobin, but Perutz’s questions about why the structure changed still were not answered. By 1970, the lab was able to construct an oxygen-free model, allowing Perutz to compare it with the oxygenated model. As Perutz later described “there came this dramatic moment when between them, the models revealed the whole mechanism.” What he was able to see was how a slight movement of the iron atom triggered a change in the whole molecule. Thus, Perutz felt he was able to explain “all the physiological functions of hemoglobin on the basis of its structure.” The results were published in Nature. 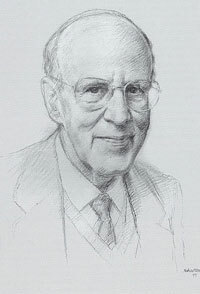 Within the field, objections to Perutz’s explanation were numerous and he spent much of the next two decades refuting criticisms and refining his own explanation. At the same time, his celebrity also rose among scientists as he was increasingly invited to give lectures all over Europe and North America. By 1975 Perutz’s fame outside of scientific circles had grown such that Queen Elizabeth II invited him to visit with her at Buckingham Palace. Afterwards, Perutz expressed his regrets to the Queen’s secretary that “she had made me talk away like an excited little boy about my own doings and that I never asked her anything about hers.” Nonetheless, Perutz did hope that the Queen would enjoy his gift, the autobiography of Charlie Chaplin. 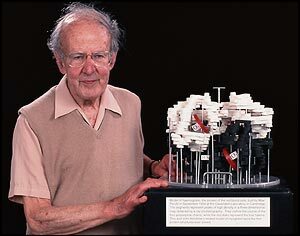 Max Perutz with his hemoglobin model. Image credit: BBC. By 1980 Perutz had begun to reach out to broader audiences more intentionally. Shortly after retiring from the chair of the Laboratory of Molecular Biology, Perutz wrote a memoir of his time there. This, in turn, inspired him to compile an account of his experiences during World War II and submit it to the New Yorker. Penned in 1980 but not published until 1985, “Enemy Alien” helped bring Perutz greater levels of fame, as he received more letters after its publication than he did congratulations for his Nobel Prize. While continuing to write for the New York Review of Books up to the end of his life, Perutz also pursued new research on proteins and hemoglobin, taking a particular interest in neurodegenerative diseases like Parkinson’s and Alzheimer’s. In 2001, right before he passed away, Perutz was still at the lab seven to eight hours a day (including lunch and tea), preparing a publication for the Proceedings of the National Academy of Sciences on the common structure of insoluble protein deposits in neurodegenerative diseases. He passed away at the age of 87, unable to reconcile his initial structure with x-ray diffraction photos which showed contradicting features that Perutz concluded arose from three different structures. The results were published in 2002, after Perutz had died, in two separate articles. 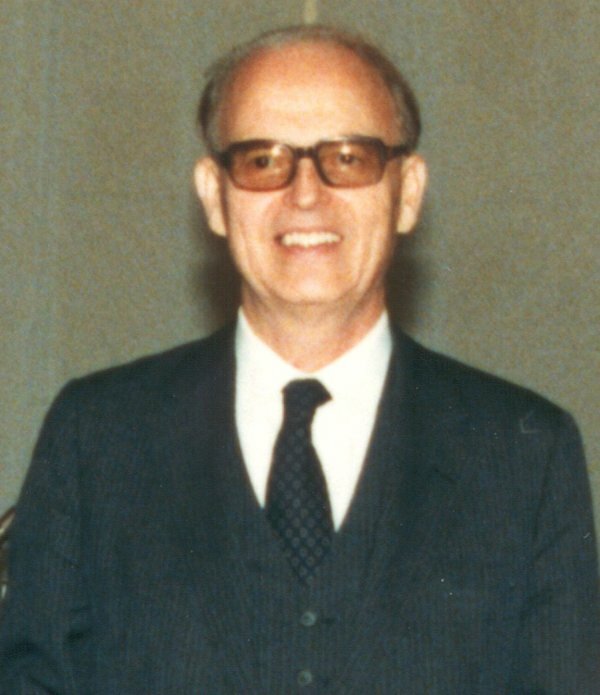 Max Perutz. Credit: Theresianische Akademie Wien. In a 2001 interview with Katherine Thompson for the British Library, Perutz said that he remembered little of these early years. 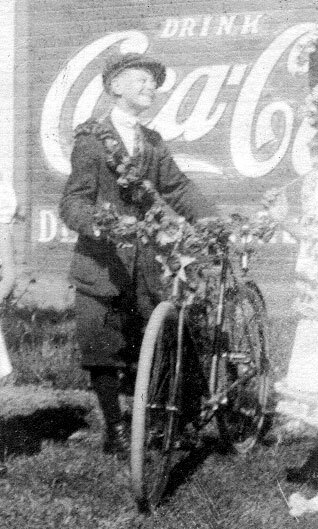 He did recall being a “very delicate child,” contracting pneumonia three times before he was six and a very serious fever at age nine. Fortunately, he was able to recover from the fever after his nanny took him to a resort in the Alps for the winter. After World War II, chest x-rays revealed that Perutz had suffered from tuberculosis, the likely cause of his fever. Perutz’s physical delicacy affected his social life as well; he described himself as a “weakling at school” who had no friends early on since he was sick so often. Because of his condition, Perutz did not excel at most sports. But his many holidays in the Alps led him to develop a lifelong love of rock climbing and skiing. These skills eventually earned Perutz the respect of his peers after he won a prize for the school skiing team. Perutz attended private primary schools until entering the newly organized Realgymnasium, which brought a shift in focus from classics to modern languages and the sciences. Perutz described his early years of schooling as “eight years of unbearable boredom.” This boredom began to wane as Perutz gravitated toward English literature, an interest enabled by his Anglophile father who saw that he was tutored in English in addition to the more common French. Perutz secretly read Charles Dickens and other British novelists under the bench while at school, later furthering this passion with his first girlfriend, who was from England. Perutz’s parents expected him to take over the family textile business once he was old enough, and were heartened by his developing intellectual prowess. However, the business route never appealed to Perutz, especially after he was exposed to chemistry by an influential teachers, and at eighteen he began formal pursuit of his interest in chemistry at the University of Vienna. (Protests from his parents were soothed by the help of a friend of Perutz’s older brother, a chemist at Dow.) As with his primary schooling, Perutz was not very impressed by the education that he received at university. He described the curriculum’s lack of mathematical training and decidedly practical emphasis as “chemistry done by heart” because of the reading and memorizing he was forced to do in lieu of actual laboratory work. But ultimately he made it through and, in the process, cultivated a new attraction to physics which he would later fulfill as a graduate student in England. From Vienna, Perutz moved on to Cambridge, where he hoped to work with Frederick Gowland Hopkins, the university’s first chair of biochemistry and recipient of the 1929 Nobel Prize in Physiology for his work on the relation between vitamins and growth. Since Perutz showed up without letting anyone know, he did not find out that he could not work with Hopkins until he actually arrived. Chastened, Perutz looked elsewhere and ended up in the Cavendish Laboratory of Physics doing x-ray crystallography. “Without knowing it,” Perutz later recalled, this “was one of the best things I could have done.” Supported by £500 sent by his father, Perutz settled in and was able to take care of his own finances for the duration of his doctoral studies. His health continued to suffer though – once in England, he began to experience frequent and painful digestive problems. The first project that interested Perutz was identifying radioactive deposits dug out from the cliffs in Cornwall. Perutz measured the half-life of the material, but found that it did not correspond to any known elements. Excited that he may have discovered a new element, Perutz shared his findings with Cambridge luminaries Ernest Rutherford and J. D. Bernal, who helped him to determine that the substance was, in fact, radium. Bernal also encouraged Perutz to publish his findings and to present them at a Royal Society soiree. This led to his first publication, “The Iron-Rhodonite from Slag,” which appeared in Mineralogy Magazine in 1937. At the end of his first year at Cambridge, Perutz spent his summer holiday back in Austria and thought about what he might do for his doctoral dissertation. Felix Haurowitz, then at Charles University in Prague, suggested focusing on hemoglobin, telling Perutz that he could get crystallized hemoglobin from Gilbert Smithson Adair at Cambridge. When he returned and acquired the hemoglobin, Perutz says he “immediately got a lovely x-ray diffraction picture,” which “thrilled” Bernal. In the midst of his hemoglobin research, Perutz also agreed to assist a man who came to the Cavendish Laboratory looking for researchers to satisfy his own interest in glacier development. Perutz saw this as a perfect opportunity to spend more time skiing in the Alps. He published his work in the Proceedings of the Royal Society in 1939, describing how melting and the movement of water contributed to glacier formation and flow. In March 1940, Perutz wrapped up his Ph.D., which described the structure of hemoglobin and the x-ray methods used to develop the model. Yet the looming threat and subsequent reality of war overshadowed his findings and began to color components of his world that were much more important than his research. Credit: National Portrait Gallery, London. 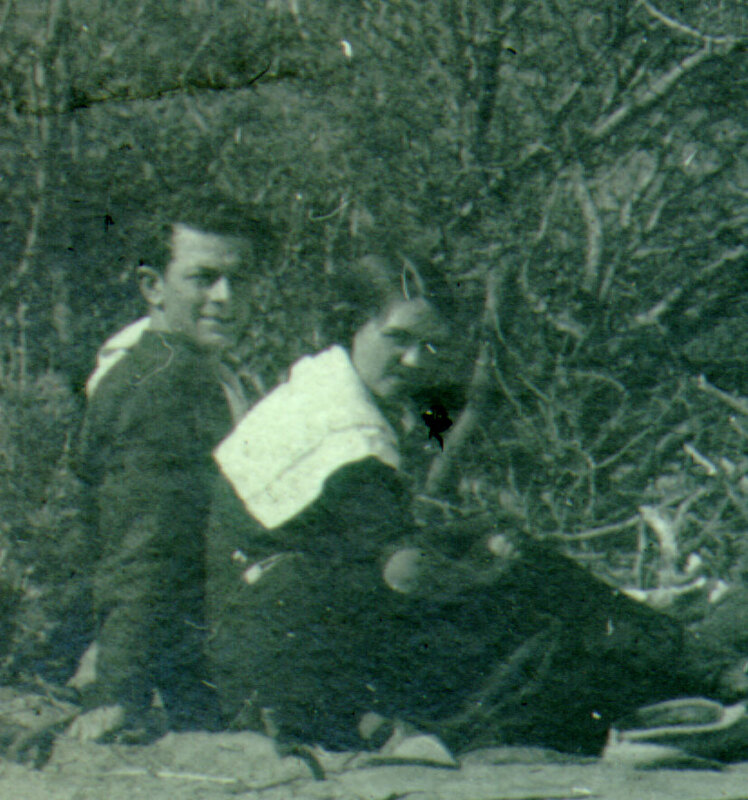 To get them to England, Max both had to prove that he could support them and was also required to pay a thousand pounds, compelling him to sell some of his mother’s jewelry and to borrow funds to cover the rest. Around this time, William Lawrence Bragg, winner of the 1915 Nobel Prize in Physics, came to the Cavendish. Bragg was very excited about Perutz’s work with hemoglobin and helped him to secure a grant with the Rockefeller Foundation in New York. The grant provided £275 per year, enough for Perutz to prove that he could support his parents. But soon the family would come into even more trouble. To have been arrested, interned, and deported as an enemy alien by the English, whom I had regarded as my friends, made me more bitter than to have lost freedom itself. Having first been rejected as a Jew by my native Austria, which I loved, I now found myself rejected as a German by my adopted country. Perutz’s friends were working on his behalf to have him released, unknown to him since he could receive no communications. Meanwhile, in Quebec, Perutz tried to make the best of things and organized a “camp university.” Hermann Bondi, a mathematician also from Vienna, taught on vector analysis, while Klaus Fuchs, a student at Bristol who fled Hitler’s persecution for being a communist, taught theoretical physics. For his part, Perutz drew on past research of his own, explaining the atomic structure of crystals to all who might be interested. The Rockefeller Foundation did not forget about Perutz and arranged a professorship for him at the New School for Social Research in New York City. Hearing rumors that his father had also been interned and worried that he would not be able to obtain a visa to travel once he had been established in the United States, Perutz was eager to go back to England to check on his parents. After several delays and transfers, Perutz arrived back in Cambridge in January 1941, finding his father already released and his friends happy to see him. 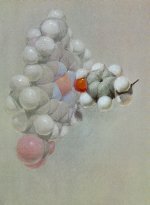 Pastel drawing of the hemoglobin structure, by Roger Hayward. 1964. Seventy-five years ago, in 1935, Linus Pauling began publishing his research on the protein hemoglobin with a set of papers titled “The oxygen equilibrium of hemoglobin and its structural interpretation” appearing in Science and the Proceedings of the National Academy of Science . In the fall Pauling extended this work and began collaborating with newly minted Caltech Ph. D. Charles Coryell, on the problem of the binding of oxygen to hemoglobin in the formation of the compound oxyhemoglobin. In April 1936, the duo published a paper specifically devoted to the subject, “The magnetic properties and structure of hemoglobin, oxyhemoglobin, and carbonmonoxyhemoglobin,” an important article which appeared in PNAS. In order to better understand this early hemoglobin work, it is important to first discuss some of the basics of the hemoglobin molecule. Hemoglobin is a major protein component in the cytoplasm of red blood cells, and is made up of two distinct parts – the heme and the globin. Its primary function is to facilitate gas exchange: it picks up oxygen in the lungs, carries it to the tissues, and returns to the lungs in order to expel the carbon dioxide produced in the tissues. There are four hemes per hemoglobin molecule, and each is made up of a single iron atom surrounded by a porphyrin ring. Each heme has the ability to bind to a single oxygen dimer, therein giving hemoglobin the capacity to bond with four molecules of O2. The globin is the main protein component of the molecule. Carbon dioxide, rather than competing with oxygen for a binding site at the heme, instead binds to the globin. 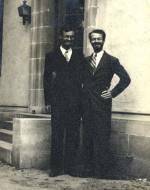 Charles Coryell and Linus Pauling. 1935. In their 1936 paper, Pauling and Coryell tackled the question of how oxygen binds to hemoglobin by looking at the molecule’s magnetic behavior, using an experiment involving bovine blood and magnets. In a 1976 interview, Pauling provided this description of their experimental design. It occurred to me that the same magnetic methods that we had been using to study simple compounds of iron, in order to determine the bond type, could be used to study the hemoglobin molecule. One of my students, Charles Coryell, and I, then got some blood, cattle blood, and put it into an apparatus. It consisted of a balance, which we had fitted out in such a way that a wire was suspended from one arm of the balance through a hole in the base of the cabinet, and held a tube. This tube was placed between the poles of an electromagnet. We filled it with blood, oxygenated blood, and balanced it to measure its weight. Then we passed an electric current through the coils of wire and the apparent weight changed. In spite of this possibly more intuitive expectation, Pauling had earlier theorized that oxygen binds to hemoglobin covalently, a prediction which the experiment confirmed. Indeed, it was found that “the oxygen molecule undergoes a profound change in electronic structure on combination with hemoglobin,” and binds to the iron atom in the heme covalently. Pastel drawing of Hemoglobin at 100 angstroms, 1964. It is interesting and surprising that the hemoglobin molecule undergoes such an extreme structural change on the addition of oxygen. Such a difference in bond type in very closely related substances has been observed so far only in hemoglobin derivatives. Clearly something of consequence was being observed. In their conclusion, the authors noted as much. It is not yet possible to discuss the significance of these structural differences in detail, but they are without doubt closely related to and in a sense responsible for the characteristic properties of hemoglobin. 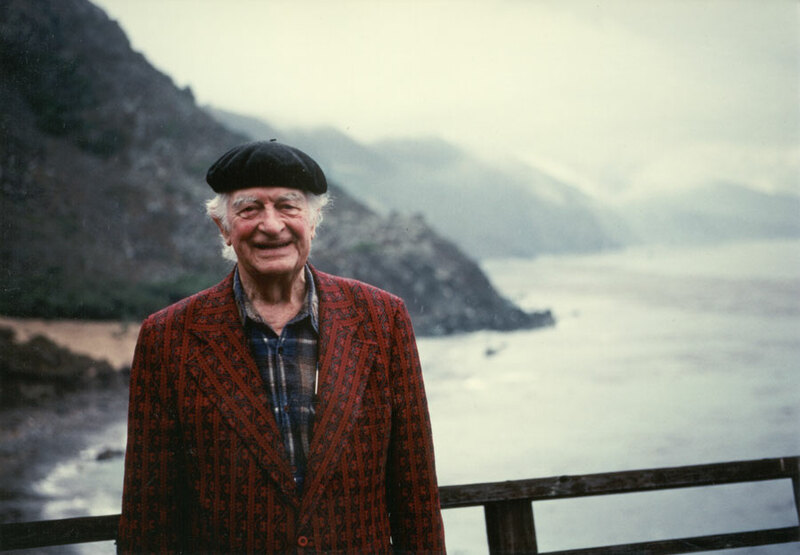 Linus Pauling’s work with hemoglobin continued on and off until his death in 1994, and led to a number of important discoveries – most prominent among them the molecular basis of sickle cell anemia. For more information on Linus Pauling’s hemoglobin research, please visit the website It’s in the Blood! A Documentary History of Linus Pauling, Hemoglobin, and Sickle Cell Anemia. 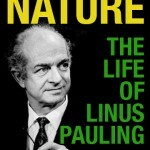 -Linus Pauling. “Molecular Disease, Evolution and Genic Heterogeneity,” 1962. In the early 1960s, Linus Pauling and Emile Zuckerkandl, a French postdoctoral fellow who had arrived at Caltech in 1959, began researching the characteristics of hemoglobin extracted from a number of different species of animals. Zuckerkandl used a technique called fingerprinting, a process taught to him by a Caltech graduate student named Richard T. Jones, to create patterns of the amino acid sequences in each hemoglobin molecule. Once patterns had been prepared for several species, Pauling and Zuckerkandl compared them two at a time, and it was from the results of these comparisons that the theory of the Molecular Evolutionary Clock was developed. The Molecular Clock differs from other evolutionary theories in that it tracks the evolution of a molecule rather than the evolution of a species. The theory states that, every so often, a mutation occurs in a given hemoglobin molecule. Generally speaking, this mutation is the source of a molecular disease, but will not cause any significant change to any organism other than its host. Occasionally, however, a mutation will cause a lasting alteration to the molecule, and as the organism with the altered molecule reproduces, the change becomes permanent. More alterations of this nature can then occur on top of the original modification, thus resulting in even more differences in those hemoglobin molecules that have descended from the mutated original. [Zuckerkandl] found that in the beta chain of the human and the beta chain of the horse, for example, 20 of the 146 amino acids are different; but with human and gorilla, only one is different. It is the same amount of difference, just one amino acid residue, as between ordinary humans and sickle cell anemia patients, who manufacture sickle-cell-anemia hemoglobin. From there Pauling and Zuckerkandl proposed that the comparative-fingerprinting method could be used to speculate as to how long ago any two species deviated from a common ancestor. Even more specifically, they reached the conclusion that one amino acid would be substituted every eleven to eighteen million years for any given species. 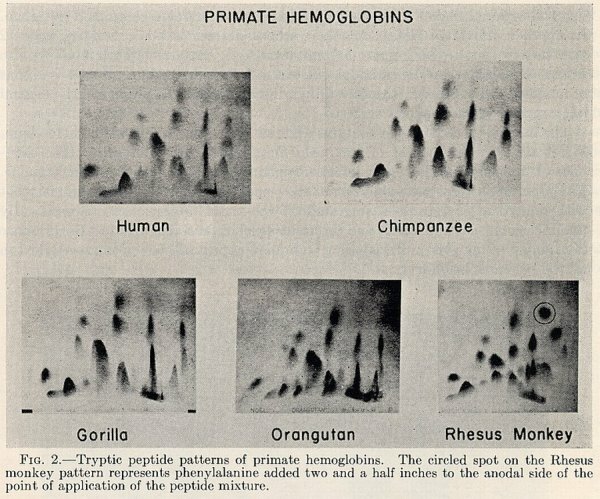 For more information on Pauling’s hemoglobin work, please visit the website It’s in the Blood! A Documentary History of Linus Pauling, Hemoglobin and Sickle Cell Anemia, and for more on Linus Pauling, check out the Pauling Online portal. During the 1940s, Pauling had established sickle-cell anemia as a molecular disease, a pioneering concept that synthesized biology and chemistry in a revolutionary manner. Other interests had pulled him away from this important work, however, for the better part of a decade. Then, in the early 1960s, he was introduced to research suggesting that rates of malaria infection in areas with a high rate of sickle-cell anemia were greatly reduced. On top of this existing research, Pauling also came across a reference to a particularly interesting African legend regarding the origin of malaria resistance. Intrigued, he decided to dig a little deeper and, before long, he had dedicated a small portion of his lab to the problem. Early in his research, Pauling found that the protozoan parasites responsible for malaria were not able to penetrate and replicate in sickled blood cells — e.g, cells containing deformed hemoglobin. Even more interesting, Pauling discovered that individuals with only one sickle-cell allele did not suffer from the effects of sickle-cell anemia but were still highly resistant to the malaria disease. 1. Individuals with only normal hemoglobin do not possess the deformed hemoglobin molecules present in individuals possessing either one or two sickle-cell alleles. As a result, these individuals are not resistant to malaria. 2. Those with the homozygous recessive sickle-cell trait suffer from sickled blood cells, resulting in a variety of health complications including stroke, ulcers, bacterial bone infection, kidney failure, and heart problems. Victims of the dominant form of sickle-cell anemia have a significantly shorter lifespan than the average human, often dying in infancy. Nevertheless, these individuals are not afflicted by the malaria disease. 3. Other individuals are heterozygous for the sickle-cell trait, meaning that they experience some sickling of the blood cells, but enough of their blood cells appear normal that they are able to survive without experiencing the health difficulties associated with sickle-cell anemia. Like those with the full sickle-cell anemia disease, these individuals enjoy significant resistance to the malarial disease. Pauling stated that the human populations inhabiting malarial zones in Central Africa were becoming predominantly comprised of heterozygotes. He explained that an individual homozygous recessive for the sickle-cell trait would probably die before reaching sexual maturity, therefore not producing any children with the sickle-cell disease. Those without the sickle-cell trait would be vulnerable to malaria. In malarial regions, this group would have a high mortality rate, many of them dying before reproducing. The third group, those with only one sickle-cell allele, does not suffer from the effects of full sickle-anemia and are immune to malaria. As a result, these individuals are best suited to malarial regions and are able to procreate, giving birth to more heterozygotes who can, in turn, continue the genetic trend. The sickle-cell trait is a hereditary disease, passed from parent to child in the Mendelian fashion. Each parent provides the child with one of the two alleles which will determine whether the child will have normal or sickled blood. Two individuals with sickle-cell anemia will invariably produce children with sickle-cell anemia. A pair in which one parent has sickle-cell anemia and the other is a carrier (meaning they have one trait rather than two) will have a 50% chance of producing a child with sickle-cell anemia and a 50% chance of producing a child with only one sickle-cell allele. A couple in which both parents carry only one sickle-cell allele will have a 25% chance of producing a child with sickle-cell anemia, a 25% chance of producing a child without the sickle-cell trait, and a 50% chance of producing a child with only one sickle-cell allele. Based on this thinking, Pauling argued that only the people with one sickle-cell allele would live to have children, approximately 50% of which would be born with one sickle-cell allele. He argued that this trend could continue indefinitely, probably until a mutation eliminated the sickle-cell disease entirely, leaving all peoples in malarial zones homozygous for an anti-malarial gene. With his theory firmly in place, Pauling turned his attention to sickle-cell anemia in non-malarial zones. Pauling was primarily concerned with the presence of sickle-cell anemia in the African American population of the southeastern United States. Because malaria is not endemic to the southern U.S., Pauling feared that a positive mutation was unlikely to occur, and the sickle cell mutation was not being removed from the gene pool as quickly as new, harmful mutations were occurring. As a result, the number of individuals suffering from sickle-cell anemia could only continue to increase. In order to counteract this trend, Pauling spoke out in support of eugenics as a means of controlling and gradually diminishing the presence of sickle-cell anemia in the United States. In the 1960s and 1970s, Pauling made headlines by giving talks on the subject. He was introducing the concept of beneficial mutations to a public not necessarily comfortable with certain implications of the phenomena. The humanitarian components of his efforts earned him praise from various medical groups, though his advocacy of eugenics created some concern among politicians, religious conservatives, and secular ethicists alike. For more information on Pauling’s work with sickle-cell anemia and malaria, visit It’s in the Blood or take a look at the OSU Special Collections homepage.